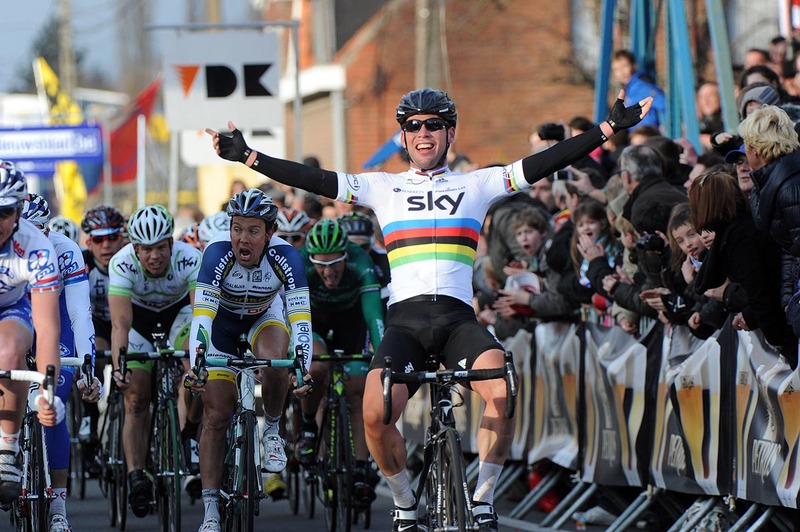 Team Sky delivered Mark Cavendish to the win on Sunday in the Belgian classic, Kuurne-Brussels-Kuurne. Defending champion and team-mate, Chris Sutton was the final lead-out man, helping Cavendish win just ahead of Yauheni Hutarovich (FDJ-BigMat). “When I got to the final corner, I knew we’d win.” Cavendish said. He had to open his sprint early at 270 metres to go, Hutarovich stayed close to him, but was unable to come around. Kenny Van Hummel (Vacansoleil-DCM) finished in third, a few bike lengths back. Several groups tried to prevent the likely sprint finish, but all were unsuccessful. 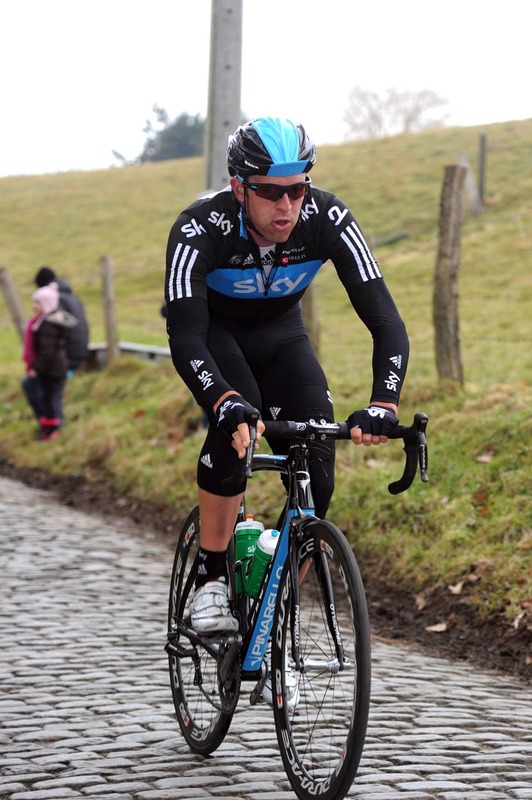 Team Sky, led by Juan Antonio Flecha, caught the last group at five kilometres remaining in the 198 kilometre Flandrian race. Sky worked all day in Kuurne-Brussels-Kuurne putting Flecha and Mathew Hayman in a key escape group with Tom Boonen (OmegaPharma-Quick Step). 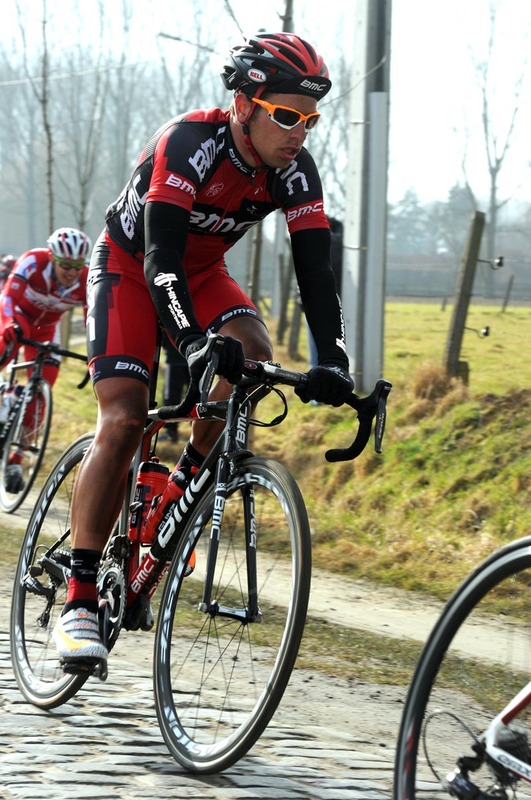 The race comes a day after Omloop Het Nieuwsblad and is often referred to as the revenge race. Yesterday, both Flecha and Boonen lost to Sep Vanmarcke (Garmin-Barracuda) from a three-man escape. Hayman was also in the escape, prior to an attack by Vanmarcke. As with Het Nieuwsblad, Boonen split the race. On the Oude Kwaremont cobbled climb, with 82 kilometres to race, he forced free a move that included team-mate Andy Fenn. The Boonen/Fenn group drew strength from Sky’s Flecha and Hayman, Alessandro Ballan (BMC Racing), Tyler Farrar (Garmin-Barracuda). They caught the leaders with 58 kilometres and the Nokereberg climb to race. Mark Cavendish was in the best of positions, he had team-mates in the front group and Greipel’s Lotto-Belisol team pulling the bunch along. In fact, Greipel looked frustrated with the situation. At 51 kilometres to race, he attacked and stirred the race. Eisel worked for Cavendish and pulled the group together. Boonen’s group, after several last-ditch attacks by its members, faded into the chase group. Sky hit the front for Cavendish. A group with French Champ Sylvain Chavanel (Omega Pharma-QuickStep), tried to escape Sky’s charge. Alex Dowsett, Jeremy Hunt, Bernhard Eisel, Flecha, Ian Stannard and Hayman led ahead of Cavendish. Sutton sat behind Cavendish and prepared to sprint if his leader could not. Sky held the escape close: 28 seconds at 40km, 53 at 30km, 41 at 20km, 24 at 15 and down to 11 seconds in the last 10 kilometres. His next race is the Tirreno-Adriatico stage in Italy. He will use it to “lose weight” and prepare for Milan-San Remo, where he hopes to win in his World Champion’s jersey.